Emerging from Harecastle tunnel I headed for Westport Lake as we had a lot of washing to do and the towpath is very wide for the line. I suppose it was after the 2nd machine load had started that I noticed the volt meter was showing just a shade over 12v, not good. After going down below decks to check for loose/broken wires and finding nothing amiss other than an extremely hot alternator I decided to call RCR. as we are covered for parts breakdown. So the next day they phoned to say it had been tested and found to be working fine. The opinion of the person I spoke to was the alternator regulator was at fault and to leave it isolated to see how the alternator functions. The regulator boosts the current going to the batteries by fooling the alternator by some trickery inside that little box that the batteries need a bit more charging. Now all this baffles me but all I know is the volt meter before the electric system had a nervous breakdown showed 14v ish. Now it shows about 13.2. this it seems is less than actual as the engineer put a meter on the alternator and it showed 14v. All these figures need looking at using my meter before I can make any judgements. We have set off cruising again so living as always with batteries being charged as normal and our power usage I can tell by the battery readout each morning if there is a problem. I might check the wiring on the regulator and connect it back into the system whilst monitoring the readings and alternator temperature while moored up. All was well this morning as far as battery power goes but I feel a few days of normal use is needed to notice any power drop in the batteries. Anyway the 2 days we spent at Westport Lake gave us a chance to have our friends Ken and Sue on Nb Cleddau on board for dinner. Beer, Wine, good conversation and a game of cards made for a very enjoyable evening. The picture on the left above is the original tunnel built in 1766 over 11years by Brindley. 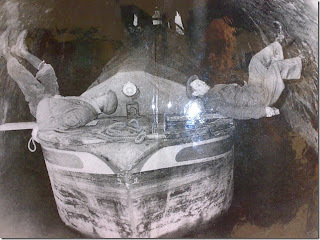 It was one and three quarter miles long and had no towpath for the horse so boats had to be legged through the tunnel. Not sure about the signage on the side of the boat but click on this link to see it in action http://www.youtube.com/watch?v=JvfJR7nUA1c . This plant grows all along the canals in Britain, with its large, hairy leaves, bell shaped pinky-purple flowers, and tough tap root that reaches quite deep into the soil. As many folks who follow along with me on FaceBook are aware, I injured my left foot last December climbing off NB Valerie to walk into town for groceries. I stepped down on the edge of the metal skirting--it being hidden amongst tall grass--with my full weight and the damage was done all along the length of my foot which swelled terribly. I took Codis 500 and tried to ignore the pain for months until I realized my foot was not getting better. Two hours of walking made it swell and throb so badly I could barely stand on it or fit my swollen foot into shoes and boots. Finally this past May a trip to Accidents and Minor Emergency at a nearby hospital resulted in an x-ray and a examination by a Physician's Assistant who said it was impossible to tell if I had broken my foot since the original injury occurred five months previously and bone heals quite fast. She could see I had soft tissue damage and "that takes a very long time to heal." She said it would take up to a year and maybe a bit more to repair completely and recommended I stay off my foot as much as possible and keep it elevated! I stravaged on but noticed that when I lay in bed at night the slightest touch of my foot against anything was painful and it still felt bruised after all this time. In one of those synchronistic events, we moored up at High Lane Bridge in Stockport on the Macclesfield canal so Les could begin his interior remodeling session two weeks ago and a lovely young couple were moored right in front of us. She is a podiatrist, and after I told her about my foot she reminded me about Comfrey; having sprained her own ankle the day before, she gathered Comfrey leaves, mashed it up and poulticed her ankle which was already feeling better. Taking her example to heart, we found some Comfrey and I mashed it in my mortar and pestle, slapped it on my foot, wrapped my foot in cling film, slipped a sock over it and slept all night that way. In the morning my foot didn't hurt, the swelling was nearly gone and I could walk with my full weight on it! In fact I just now stood and did dishes and I wasn't even aware of my left foot--for the first time since December! 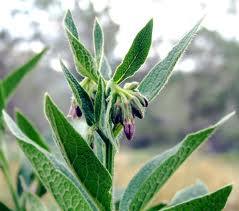 I will continue to poultice with Comfrey for another week to ensure full healing. I was inspired to write this post for Vic on No Problem who has injured his arm with a rather bad bruise according to his wife Sue. It is not always easy to get an appointment for a doctor while continuously cruising. Even then the most they can usually do is prescribe anti-inflammatories and tell you to take it easy. Nature's medicine chest is right outside our doors, easily obtained and contains strong and effective cures for so many things that ail us. Heal well and quickly Vic! Dear Kevin: This is a Tapp Sandwich! After reading the last post, Kevin in Derby who reads our blog regularly asked in a comment, "And what pray tell is a Tapp Sandwich?" Here is the answer with a bit of history: back in 1996 I lived in Spokane, Washington and worked for Spokane Public Radio (think U.S. version of the BBC radio). I was a single parent with two children to raise, college loans to pay off, and my wages were a miserly $15,000.00 a year. A very upscale, rustic bakery called Fugazzi's, owned by the boutique Hotel Lusso opened up on Monroe Street nearby. The smell of fresh baked loaves of Pan Rustica and the enticing scene in the window of their deli sandwich bar drew me in despite the $8.99 price tag of a lunch plate. One large Granny Smith apple, cut into thin slices. Place the mayonnaise in a small bowl. Add the diced mint and mix well. spread liberally on one piece of bread for each sandwich. Lay the Turkey meat on top. 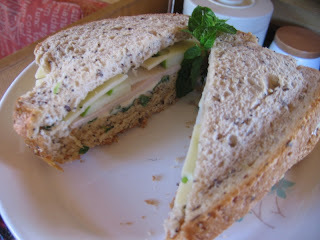 Place thin slices of Granny Smith apple overlapping one another on top of the Turkey, and top with a slice of cheese and the other slice of bread. Viola! Simple, easy, unusual and divine!! Kevin in Derby, I hope you will make one and give it a try. "No matter what, no matter where, it's always home if love is there." ~Anon. After just over a frenzied week of interior remodeling aboard NB Valerie and two days cleaning from bow to stern, we woke extra early on Sunday morning, August 26th to move from Lyme Green on the Macclesfield Canal down through the flight of twelve locks at Bosley and on toward Congleton and our rendezvous with American visitors. Of course rain was forecast for most of Sunday so we just decided to go for it. Imagine our surprise when we discovered the Macclesfield Canal Society was in attendance! Bless those marvelous volunteers for giving up a day of their bank holiday weekend to help boaters through the locks. We made a donation and enjoyed a natter with each of them as we traveled downward, enjoying the spectacle of the Cloud wreathed in a gauzy mist. We moored up on the Danes Aquaduct overlooking the Biddulph Valley and I put a pot of beef stew on to simmer for dinner and baked a Chocolate Kahlua cake for our guests. Dear Sir and I were both knackered having worked hard to get things in literal ship shape. We enjoyed our brothy dinner with par-baked rolls and slices of sharp cheddar cheese, went for a walk and fell into bed earlier rather than later. I slipped away to sleep accompanied by the hemming and baaa-ing of a field of nearby sheep who were serenaded by a very loud broadcast of Elvis Presley from a local landowner. Odd isn't it?? 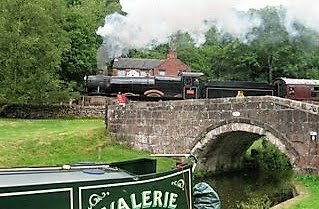 Today we rose early again, jumping out of bed to shower, shave and move down to the 48 hour visitor moorings at Congleton, just near the steep steps up to the Nag's' Head pub which is across the way from the rail station. At 12:30 or thereabouts the train pulled up, and lo and behold there was our American friend Kilaynn Glubrecht and her lovely granddaughter Alana all the way from Spokane, Washington, USA! Kialynn is one of the Wednesday Women who vetted Les when he returned to American in February 2011 to propose to me. She is a math instructor at Spokane Falls Community College. Kialynn has always amazed me with her concise ability to reason at the speed of light and her sharp and pithy wit has kept me in stitches many times over the past seventeen years. She is also a fabulous cook and I've enjoyed many fine meals at her home. I was pleased therefore that she and Les got on well with one another from the first. 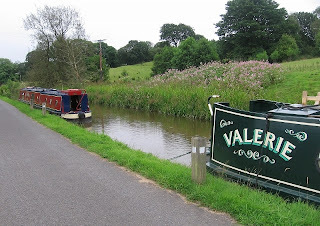 We boarded NB Valerie for a chat while I fixed Tapp Sandwiches, grapes, and Elderflower cordial for lunch, getting underway soon after with Les at the tiller. It was wonderful to see their amazement at how spacious a narrow boat actually is, and how well organized ours is--especially after all of Les' terrific carpentry. We women sat out on the bow and had a good chinwag as the lovely countryside passed. I am caught up now on how the other Wednesday Women are doing (Hi Babes! I sure do miss you! Les and I look forward to having a dinner with you in November); we talked about what our children are up to, and I reflected on life abaord a narrow boat. The rain commenced once more and and we went inside to warm up by the stove. After hearing about the highlights of their visit to London and Windsor, we had hot chocolate with brandy and joined Les at the stern so Kialynn and Alana could see how a lock worked. It was only a stop lock at Hall Green on the bottom of the Macclesfield canal, but it still allowed them to watch the process. Les jumped off and tied off the mid line, asking me to throw him a windlass. My first attempt ended up bouncing off the bank and landing in the canal! So did my second attempt. To much laughter, Les got out the BIG magnet on a rope and proceeded to pull one of our six windlasses out of the drink. He never did find the second one, which we found recently laying in the dirt near a swing bridge. Folks off a nearby hire boat came over to ask what we were fishing for which led to another round of crazy laughter as we explained fishing for windlasses with a magnet. After moving through the lock we came across the two final aquaducts, making the turn to the left past Red Bull Boat yard, cruising slowly through the permanent moorings. Just before Kidsgrove bridge we encountered a boat in trouble. They were trying to make their way towards shore without any power. We slowed down, and one of the gents clambered aboard the gunnels of NB Valerie, walking his way towards the stern with his mid line in hand. After pulling their boat in to ours, Les took us to shore and the fellow climbed off, pulling their boat in to land. They had a sleeping bag wrapped around their prop!! After a grateful thanks to us and a suggestion from me that they might wish to call River Canal Rescue if they couldn't get it unwound themselves, we started off once more for the junction of the Macclesfield with the Trent and Mersey. As we came under the bridge we saw another boat in distress! 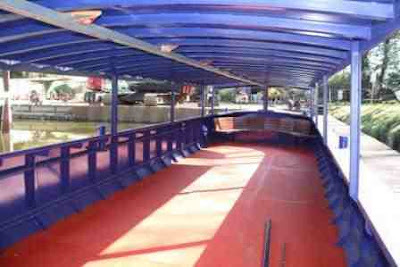 This was a hire boat which attempted to turn onto the Maccie and overshot the bridge hole. As we came through and turned onto the T & M, Les shouted encouragement to the couple. The wife said with a smile, "We've already hit both banks before the bridge so we might as well try for the rest of them." We all laughed, and Les gave them some advice and a couple of pointers which worked. 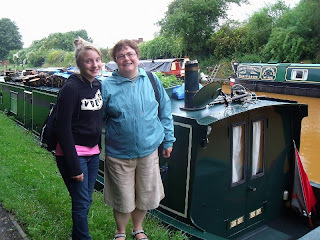 As they slipped away onto the Macclesfield, we moored up for a cup of tea and a slice of chocolate cake while we waited for 6:30 and the train which took Kialynn and Alana back to London. They had a great time, with some unplanned events which will lead to fun tales back home. 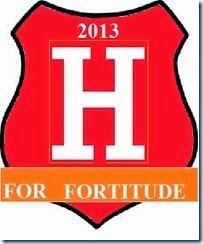 We enjoyed their visit thoroughly. It was wonderful to see you sister friend. Alana is a lovely creature; smart and funny like her Grandma. Thank you both for gracing our home with your presence; for taking time from your very busy trip to England, to spend a day cruising with us. Today we had to descend the 12 Bosley locks regardless of the weather. Monday we have visitors from America travelling up from London. After a very wet night with violent thunder and lightning we woke early, and we find it hard to believe but were cruising by 7.30am. As we approached the services at the top of the locks Jaq popped her head through the hatch and informed me we had no cold water but the hot was fine so her washing machine was happily carrying on. Having run out of water our timing was perfect as we were stopping for water and to off load some of the old wood from the DIY project. More good timing was the arrival as we entered the top lock of the Macclesfield canal society to raise funds by operating all the locks for boaters. They had their Marquee erected part way down the flight selling books etc and a photo display of work they have performed along the canal. Above left is the progress so far of the changes we are making. On the right you can see the steps and the angled cupboard both sit in almost the same floor space as the new wider steps and cupboard. The same space now gives much more storage. On the left I have built in some drawers in the awkward area around the steps. Above the drawer within the main cupboard I will install shelving to the requirements of the captain Jaq. That TV bracket was a pain and is in fact the 3rd one I installed. The first had a part missing, the replacement did not tilt enough making the picture dull. The 3rd is a super dooper tilt, swivel and extends also makes tea while watching a film. The next part of the project will be the stove to the right of the steps. This will involve removal of the stove to enlarge the base and to re tile around and below the stove. The last few days have been like being back at work so perhaps the stove might need to wait a while while I do a bit of relaxing and build up the energy for it. The Upper Peak Forest canal was constructed in 1794/6 and such was the slope here that substantial stone buttresses were built to support the towpath. Many of the buttresses can still be seen 200years on, such was the quality of the work. In 1897 the Midland railway company were looking to build a line from Heaton Mersey to Sheffield and the route would pass lower down the slope. Although the canal had given no problems in the 100 years it had been at this location the railway company were troubled. They believed the canal could burst it`s bank and wash the railway line away. In 1903 the Midland and Great Central railway owners of the canal agreed to move about 328 yards of the canal to the south. This was so the canal would sit on more stable ground but I think looking at the site today the railway company were worrying about nothing. To the left the towpath edging stones. Centre is the towpath and to the right one of the buttresses. Location map. Note the winding hole in bottom left. The location today looking from the winding(turning point) hole. This is after bridge 27 heading towards Buxworth. If you go looking force a path through the greenery just about where the boat is moored. You can see the new route bends to the right. Here at High Lane there is a fantastic very large diy store that cut all the Oak panels for me and then delivered them to the boat for £4($6). I will publish some before and after pics when it`s finished. Buxworth was a joy but rather than blog again I refer readers back to my previous visit in 2009 HERE. Also there is a picture story on Bugsworth basin HERE. Use the lower video. 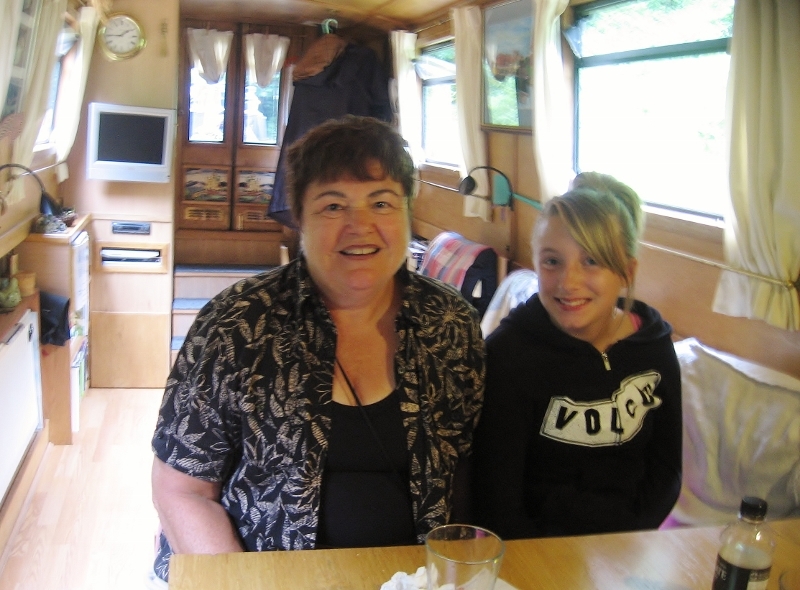 We met bloggers Jacquie And Stein on `Like Ducks 2 Water` and spent a few hours chatting and drinking aboard their home. Always nice to meet fellow bloggers for the first time. Anyone passing them along the canal you best not pass them by as you will have missed meeting two very nice people. This is the 3rd Terrapin I have spotted since being afloat. This one was to busy sunning itself to worry about me reversing to get a picture. Not a clear picture as I had to dive into the boat for the camera and quickly use the full zoom. It`s a hire boat that passed us and they were just about to go under a bridge. Whether my shout caused this lad to lift his feet I don`t know but at least he did. The gap where his feet are is about the same as that on the right. Not really enough for his feet and if the steerer were to make a mis calculation his feet would be crushed. Up on the Macclesfield canal we are traveling through the stomping grounds of our friends Sue and Ken Deveson. 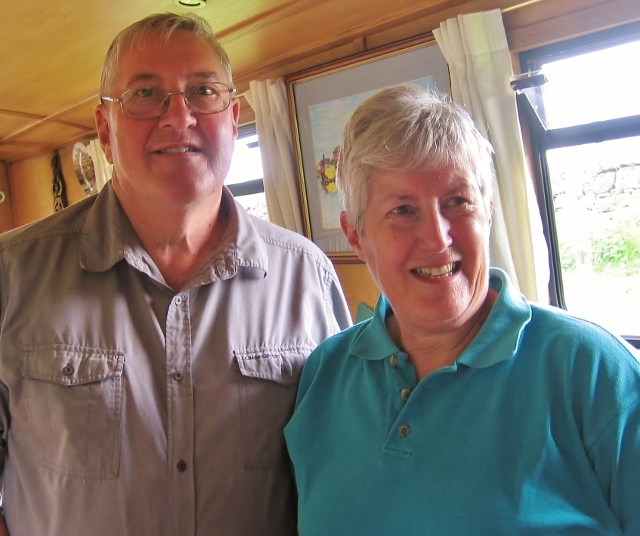 I first made their acquaintance about two and a half years ago when I found Sue's blog Boatwif, about their travels aboard NB Cleddau. I emailed her about their composting loo which fascinated me. They were one of the first couples to come and meet me and Les when I first came over to England in May of 2011 to meet Les' family and friends, and they stopped in for a visit again last autumn after me and Les returned from our wedding in America. Finally we have caught up with one another aboard our boats! We enjoyed a visit to NB Cleddau yesterday for tea, delicious Rosemary Orange Cake, and a tour of their boat which is indeed lovely. I finally got to see the composting loo on board a narrow boat and I am ever more impressed than when I first read about the idea. Sue and Ken joined us aboard NB Valerie today for coffee, Banana Cream Pie, and a long natter about this and that. We have unique perspectives on Britain and America, having family and loved ones in both places. Visiting with the Devesons made Les and I realize once more how very fortunate we are to live our lives on the cut; to have time to stop, enjoy the view and share in the company of good friends. 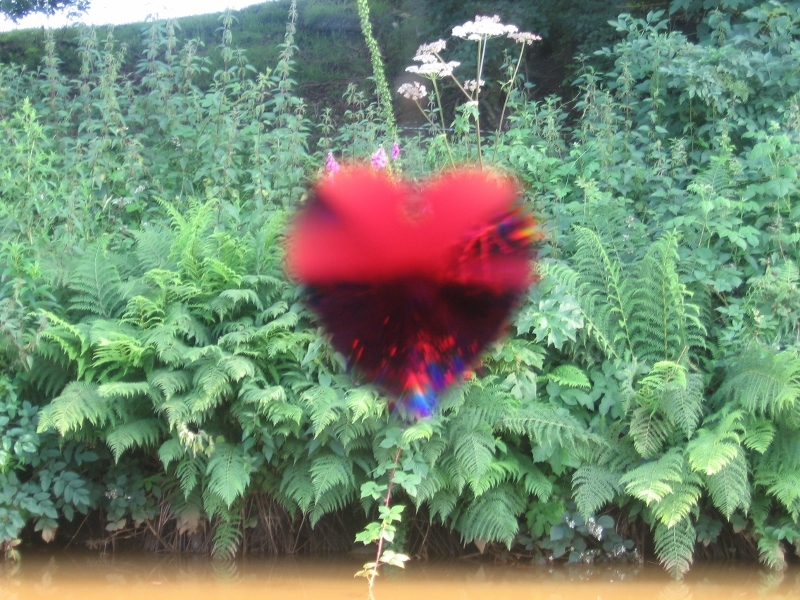 I could hear the music coming along the towpath as we walked up the Marple flight. The ring of bells pub had the Stockport Silver Band playing in the garden. Click brass to listen. Brass bands in the UK have been associated with many industries over the years. Mines, Mills and village communities had a band some dating back 150years. This weekend sees a Perseid meteor shower starting Saturday night the 11th going through to Monday night. The best show will be Sunday night. Advice is to have a clear view to the east. 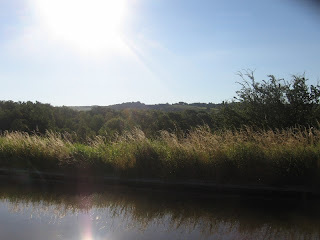 The above is the view from the boat to the east across the Goyt Valley. This picture is a first for me in as far as it`s the first time I have stitched two pictures together. The gate post was the edge of each picture. So looks like another late night for Jaq and I, 2am last night, but who cares our life is our own. There is likely to be a few dozen shooting stars per hour. U.S. link for Meteor shower is here. Just to finish, i have just found the small section of the Upper Peak Forest canal that was re routed many many years ago. More soon when I calm down, you know i love the history of where i live. Jaq had me watching Gymnastics and synchronised swimming pairs. I have not watched to much of the Olympics but must say how much I enjoyed watching these two sports with Jaq. Can table tennis be classed as a sport? I see Water Chariots are now charging £20 ($30) for a boat trip to the Olympics. The original price was £95($145) which then came down to £45. BW gave the company a 15 year licence to operate canal boats in the area. Some of the boats will be available after the games for self hire following a re-fit. Some will be available for charter and all will operate from a canal boat hire base in Limehouse. 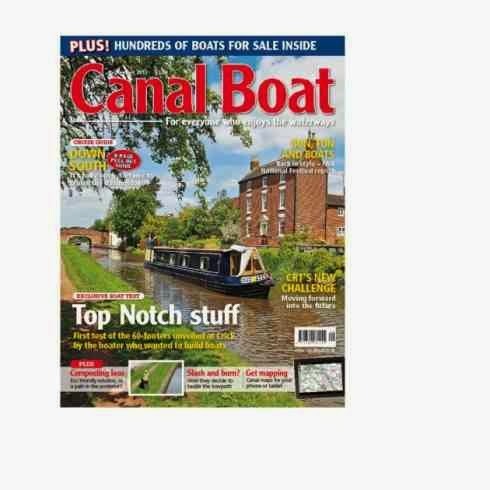 Picture from Canal Boat magazine. Just spent 3 days with this view just past Strines Aqueduct. We were along the upper Peak Forest canal and found this spot with just room for one boat amongst tall reeds, no they are not reeds in the picture but Jaq`s roof top herb garden. 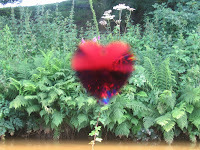 We entered Whaley Bridge with the intention of visiting Tesco and staying the night and making a train trip into Buxton. We ended up mooring in a section near the basin marked Permanent moorings that was empty. This was next to the visitor moorings(room for 4 boats) but only one today as per the picture below they have all collapsed into the water. Anyone tell me the difference between Long Term and Permanent as in the picture above. So we just carried on into Bugsworth Basin where there were plenty of moorings. As you might remember Jaq bought me a Kindle for my birthday. Amazon UK have now sent me a code giving £10 off for a friend to use. It is a code that can be used at checkout BUT it runs out on the 10th August at midnight. It is valid for Kindle only, not Touch or Keyboard. So if you want the code it will be the first comment I receive with an E Mail address which I won`t publish of course. Seems a shame to waste a discount if someone out there is about to buy a kindle. Kindle here is very expensive compared to the U.S. The basic £89 ($134) Kindle is available on Amazon U.S. for $79(£53) so Jaq might get herself one when we go over later in the year. This wall leads into lock 7 and as you can see has collapsed. There is a narrow track running down here which might be to give access to a house or two or perhaps it might be just for maintenance access to the lock flight. Anyway part of it is now in the canal. The track has been diverted and a hard surface laid. Boats were being helped up the flight today and BW will be back to help others through Monday. So the top gate is padlocked and instructions left to phone Red Bull for information. I would guess a lengthy stoppage will be needed to drain this pound to re-build the wall so be warned if cruising this way. We have just moved off after being moored for 5 days. Our post which consisted of some books Jaq had ordered on Amazon and some Silicone grease plus some of that Rescue Tape I ordered from E Bay. The grease is for the Vetus stern gland and the tape is just there for emergencies. A nice view both ways from this mooring at Congleton across the Biddulph Valley. This is on the embankment just before the aqueduct between bridges 72/73. view from passing boats. We cut quite a bit and now it has been split and stacked on the roof there is room for more on the way back. Just before I hit the publish button I must report the sighting of a Blue sky with sunshine and also the fact it isn`t raining.........yet. What a wet summer!